It’s a service which enables people to sell digital products with just one click. No hassle – no need to set up an online store. Since it started in 2011, it’s expanded its service considerably. Now you can use Gumroad to sell physical products too, and it handles the payment and order fulfilment side of things for you. You can even sell subscriptions to a regular flow of content. So there’s something which should be of interest to writers. But I’ll cover more about Gumroad in my next posting. Here’s a nice little example of how this works. First we have “Lost Wax” showing us how to make a steampunk top hat. This looks like fun! The video is only 4:22 minutes too, so it’s something entertaining to watch if you have five minutes to spare. As you can see, the video ends with a link to click to download the pattern to make the hat. That seems fair enough. The guy has entertained us and shown how to make something useful. (Well, it’s useful if you wear steampunk fashion – which I don’t, by the way, but it’s interesting to look at.) Now he wants to sell you something. But it’s not a hard sell. If you like what he made, you can make it too. And it’s easier to make it if you use his pattern. Sure, you can make it yourself and figure out your own pattern, but for the sake of five bucks you can avoid all the hassles of measuring and trying to get the thing to fit together. Plus he gives more detailed instructions in his download. It seems like a pretty good deal to me. If you click on the link it takes you to Gumroad who deal with the payment and file fulfilment side of things. Neat, huh? And finally, I wonder how much money Lost Wax is actually making from doing this. 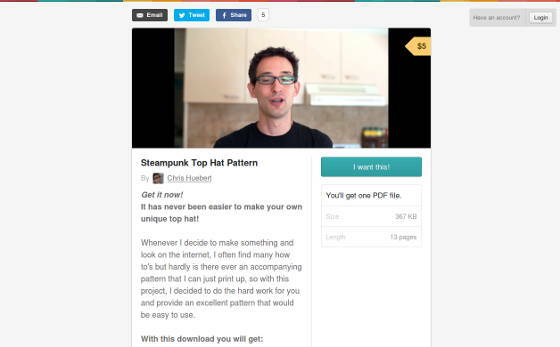 I wouldn’t have expected the type of person who would want to make a steampunk top hat would be the kind of person to pay five bucks to download a simple pattern. Still, when you’re passing the hat around, every little helps. OK, OK, I’ll get my coat. Read my next article for more about Gumroad! Are you using Gumroad? Have you used them? Please share your experiences by commenting below. You can even tell us if you’re making a steampunk top hat. Send me a picture!